""Having a gay time now?" she inquired. "Much better." I turned again to my new acquaintance. "This is an unusual party for me. I haven't even seen the host. I live over there-" I waved my hand at the invisible hedge in the distance, "and this man Gatsby sent over his chauffeur with an invitation." For a moment he looked at me as if he failed to understand. "I'm Gatsby," he said suddenly. "What!" I exclaimed. "Oh, I beg your pardon." "I thought you knew, old sport. I'm afraid I'm not a very good host." He smiled understandingly-much more than understandingly. It was one of those rare smiles with a quality of eternal reassurance in it, that you may come across four or five times in life. It faced-or seemed to face-the whole external world for an instant, and then concentrated on you with an irresistible prejudice in your favor. It understood you just so far as you wanted to be understood, believed in you as you would like to believe in yourself, and assured you that it had precisely the impression of you that, at your best, you hoped to convey. Precisely at that point it vanished-and I was looking at an elegant young rough-neck, a year or two over thirty, whose elaborate formality of speech just missed being absurd. Some time before he introduced himself I'd got a strong impression that he was picking his words with care." I'm counting down to The Great Gatsby release May 10th by pairing a passage from each chapter with an image from the movie. 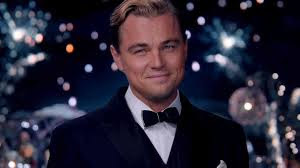 This shot of Gatsby takes place at one of his lavish parties; it's tough to know if it's the party where he and Nick first meet but I couldn't resist the smile. Wonder how Luhrmann will treat that meeting; The way Fitzgerald wrote it with Nick seemingly falling into casual conversation with a stranger who turns out to be Gatsby was perfect. The 1974 version handled it with a thuggish 'valet' delivering Nick to Gatsby's inner sanctum; I thought it was a pretty heavy-handed interpretation, leaving so little room for mystery regarding Jay's acquisition of wealth, so early on. I'm not a fan of reading online and found reading What Maisie Knew a total pain; reading Gatsby on this service was a breeze; really easy on the eyes. Nope! I don't get a commish - sounds like I do, doesn't it. I'm so excited about the release of this film and your countdown is a good part of the reason why. Thanks! That smile definitely looks charming and would put me at ease, cause I'm not as wise as Nick.